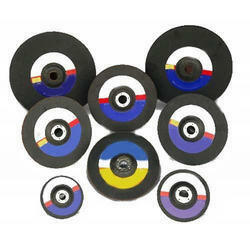 Our range of products include depressed center wheels and dc wheels. With firm commitment to quality, we manufacture a comprehensive range of Depressed Center Wheels. We also offer Depressed Center wheels with zircon grains for Very High Material Removal Rate. Moreover, our offered products are normally used on portable angle grinders for grinding weld bed, cutting-off gates & risers and cleaning metal surface. Our products find their extensive applications in all steel mills, foundries, metal fabrications plants, ship yards, welding shops and pipeline industries. With firm commitment to quality, we manufacture a comprehensive range of DC Wheels or Depressed Center Wheels. We also offer Depressed Center wheels with zircon grains for Very High Material Removal Rate. Moreover, our offered products are normally used on portable angle grinders for grinding weld bed, cutting-off gates & risers and cleaning metal surface. Our products find their extensive applications in all steel mills, foundries, metal fabrications plants, shipyards, welding shops, and pipeline industries.